Morning, hope you're well and ready to face Thursday. I'm overwhelmed at the amount of lovely bloggers who joined me on my first ever #linkup. Chic & Stylish went live last week without any hitches - phew, how did I manage that! I don't know about yours but all my Spring clothes are just begging to be worn! What with snow, rain, wind and a little sunshine I don't know whether I'm coming or going. So as they are begging to be worn, that's just what I did. The sun was shining (well sort of) when the photos were taken, so it felt perfect to wear white. I've started to adhere to wearing them in winter as well as the other seasons, it's what you pair with it that makes it work, oh and the weather has a hand in the decision too! I wanted to feel brighter and this gorgeous kimono did the job. I bought this from TK Maxx over a year ago, and as they are back in fashion, were they ever out? it seemed the obvious choice. And the colours, aren't they striking? Love the fringing, again this is back on trend - giving sass with a boho feel. 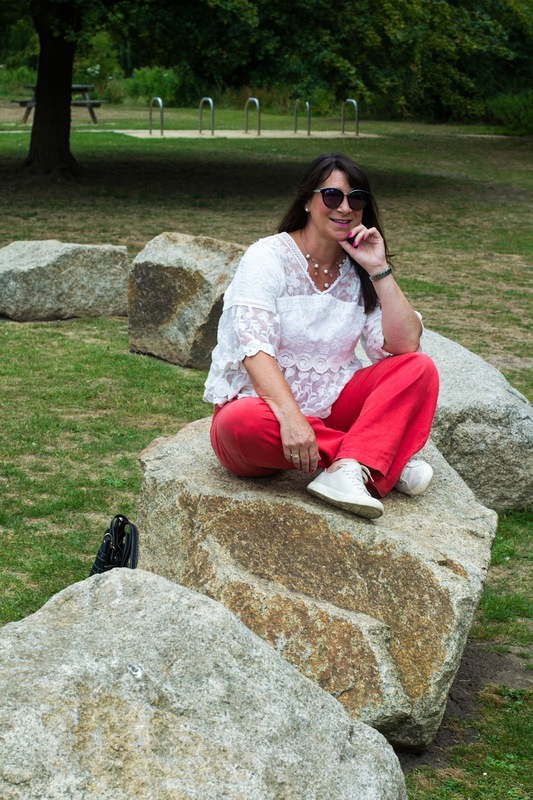 My jeans are a straight leg style which I'm preferring to the usual skinny jeans I wear, more flattering & a little more sophisticated. The sleeveless sequined vest top wasn't really warm enough, but I'll happily wear this when the weather changes, at least my kimono kept the chill off whilst taking these photos! Do you like white shoes? They're a bit Marmite - you either like them or you don't. I love them, always have a pair to pull on with most outfits and go. When I saw these on the Lotus Shoes website I was all over them, imagining all the looks I could create, & this was the first one that came to mind. Items marked with * have been gifted to me, however these are 100% my own & honest comments. Here's the shoes I fell for. These white patent filbert shoes* have such a cute little heel which is just the right height for everyday duties, but also classy for dinner out. 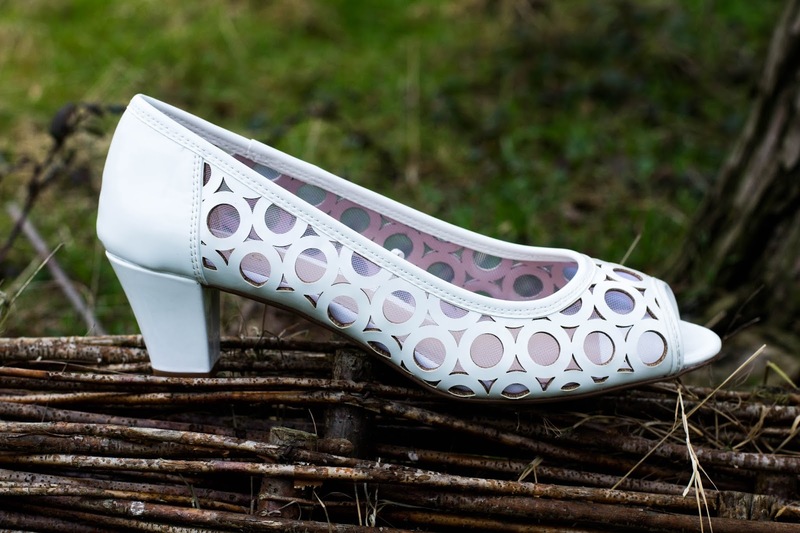 The circular laser cut outs are backed with a see-through mesh which give a light airy feel, so along with the peep toe the shoes have a real summer vibe. I was a little annoyed with myself that I hadn't got my toe nails painted, quickly remedied by a splash of Unicorn Hologram polish - on the nails you can see - lol! I felt matchy, matchy with this outfit so opting for the matching White patent Solana* clutch bag was the only choice I wanted to make. As with the shoes the laser cut detailing it's just so stylish. The fact that you've got a long shoulder strap gives the bag another dimension. A clutch for the evening, and over the shoulder for a lunch date, or even shopping, enough room for your purse, phone and lipstick! Join me for Chic & Stylish Linkup. 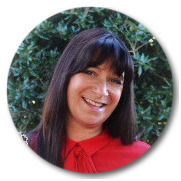 You must visit Suzy's blog, you can find her at Pixie Chic in Portugal. I love Suzy's outfit maybe because we both picked a red pleated skirt, but paired with her grey cardigan it's a winning look. I especially love her long necklace and matching dangly earrings. Thanks so much for joining me today, don't forget to link up so I can see your Spring outfits. If the weather changes we'll all be ready to show off our new looks. See you on Monday, it will be the next instalment of Style Not Age & I'd love to see you here. Love the Kimono! I'm a bit undecided about white shoes. Being an Essex girl an all that! I've always vowed not to wear them because of our reputation! Some gorgeous spring colours here, Jacqui. Loved Laurie's comments about the shoes! I tend to steer away from white shoes but an ivory seems to work for me. Hugs, x.
Jacqui, Congratulations on a successful first link up! I am loving this kimono. The color is so beautiful and layered over all white really makes it vibrant! I am so craving Spring and wearing my Spring clothes but it is just too darn cold here! I love the column of white with the kimono Jacqui!! It's perfect!! Lovely kimono! So pretty. Love the shoes and bag too. Will be very versatile this summer. This whole outfit is amazing! I love how unique those shoes are! Also, congrats on your link up :-) So happy to join! Fabulous kimono, love the color and with the crisp white! Your beautiful blue kimono looks so fab over your white ensemble! The shoes and bag are just so Cute! I really like the circle design. When you are told for years that white shoes are passe, it can be difficult to embrace them again. I admit it took me to get on board, but I love how fresh they look now. What a crisp, clean, fresh outfit! That cobalt works so well with White! That kimono is gorgeous, love the print and details. That kimono is lovely! I love the color and the fringe! Your clutch is so cute with those shoes, they match so well! 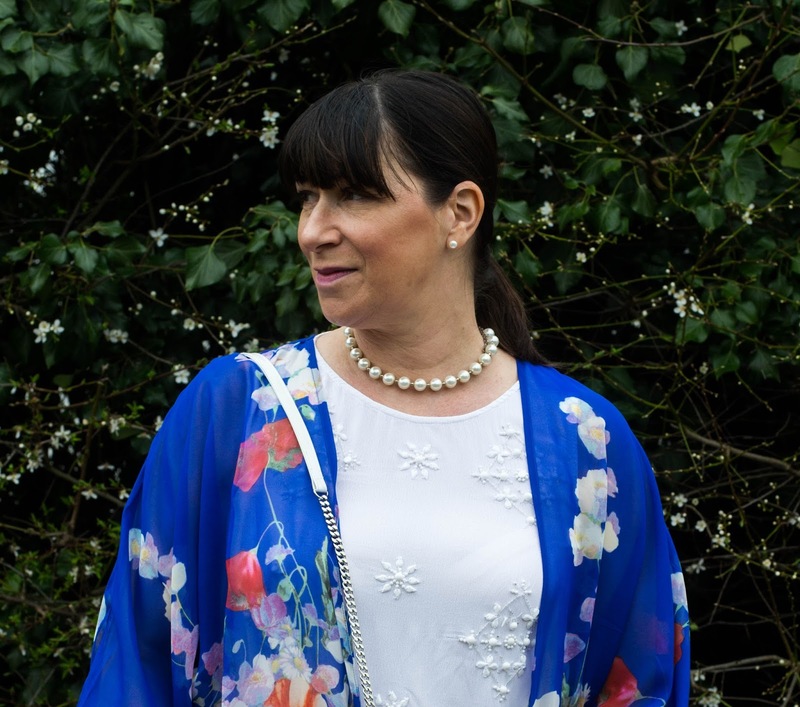 I love that kimono and that white glitzy top under it is so perfect for the Spring! I am ready for all things white! This is a beautiful look! I love white shoes and think matching the bag is so classy! Jacqui, you look absolutely gorgeous in white! And that kimono is divine, especially that shade of blue. The shoes and clutch and so pretty! I'm amazed you were brave enough to wear such a warm weather outfit though... wasn't it freezing? lol! Thank you SO MUCH for featuring me. I feel very honoured. Yay for new link ups! Thank you for inviting me to join. Now onto fashion...I love the details of your outfit...the chic, yet simple white with fun details in the shoes and purse combined with the beautiful colors of the kimono is just fabulous! ;0 Have a wonderful weekend. Great look Jacqui. I need some new white jeans. I do not know if I should work a bit hard to get into my 2 pairs that are too small or buy some new ones!? Love your shoes. Perfect sized heels. Thanks for hosting, I've stepped away from the computer this week as I have been poorly, just catching up now. Thanks for hosting. Thanks Mica, love mine and have another to wear when the weather is better too. Glad you like the shoes, thanks for linking up with me today. I hear you on the weather. I am over winter but it just doesn't want to let go around these parts yet. Sigh. You look lovely and I love the matchy match with the purse and shoes. I'll join you next week for the link-up. The shoes and bag are perfect for Spring! I love the kimono too, such a pretty and fresh outfit! Aw, you're kind Emma, thank you so much for joining me on the #linkup. x Have a great week. Many thanks for your commenting today! Congratulations on your first link up! That is awesome! High five! I love your kimono. The color is bold and vibrant and the fringe details on the hem are perfect and add a fun element to your outfit. You look great! Wishing you a happy Monday! This kimono is a great colour for you and will go with so many things. I've just bought one from a charity shop and can't wait to style it up. And yay, hurrah for your link up party - well done for taking the plunge! This kimono is so cute! I love the bright blue and how it pops with the all white outfit. The shoes and purse are absolutely gorgeous! Love the bright cobalt on you and how you created a white column so pretty and vibrant! I have been looking for white shoes and bags myself, love the circle pattern on these.